New Japanese Prime Minister Shinzo Abe spoke Tuesday during his first press conference after forming his Cabinet, at the prime minister's official residence in Tokyo. JAPAN'S new prime minister, Abe Shinzo, has said he wants to make Japan "a country that is trusted and loved" by the entire world. On the face of it, this should not be that difficult a task. After all, in the past 60 years, no nation has been more peace-loving, more committed to nonaggression and non-use of force, and more generous to its neighbors than Japan. Nonetheless, Abe has his work cut out for him, given his image as a "hardline" Japanese nationalist, and in light of the emotions stirred by some of the actions of his immediate predecessor, Junichiro Koizumi. The new prime minister's most immediate foreign policy concern is likely to be the easing of Tokyo's tense relations with Seoul and Beijing. At the same time, he must maintain the relationship with the United States that reached new heights under Koizumi. In truth, the two tasks are not unrelated. Improving relations with Tokyo's neighbors also will serve the long-term interests of the U.S.-Japan alliance. 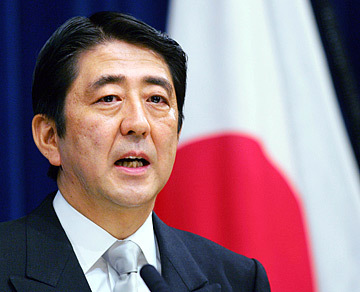 THERE ARE several things Abe should do to make Japan more "trusted and loved." » The first and most important is explaining Japan's place in the region and the world and how the alliance fits into that vision. Japan made remarkable progress toward "normalcy" during Koizumi's tenure. High water marks include participation in the Afghanistan and Iraq coalitions, joining the U.S. missile defense program and leading diplomatic initiatives dealing with North Korea. All the while, however, there has been no attempt to explain -- to the Japanese people or to the rest of the world -- exactly what Japan's goals and ambitions are. To what end is this new diplomatic activism? What would a more "normal" Japan look like? Likewise, Abe has said that he plans to pursue a "more assertive foreign policy" while also soothing relations with Japan's neighbors; insights into how he plans to square this circle are needed. Abe also has stated that he intends to continue his predecessor's aggressive pursuit of a permanent seat on the United Nations Security Council. But Abe has said little about what could be expected from Japan if this quest were to be successful. He must articulate his vision of international relations, Tokyo's place in that order and how its power will be used, and the principles that will guide its diplomacy. A more nuanced handling of sensitive issues (such as Yasukuni Shrine visits) is essential to lend credibility to his words. It is also critical that Abe spell out the alliance's place in that diplomacy, what he expects of the United States and how the two countries can work together to realize shared aims. Like his predecessors, Abe must assure Japan's neighbors of the strictly defensive nature of the Japan-U.S. alliance and reaffirm Tokyo's view that a strong alliance is not an impediment, but actually provides the foundation upon which to build better relations between Tokyo and its neighbors. In this regard, Abe's pledge to make Asia the destination of his first overseas trip (rather than Washington) sends a positive signal. » TOKYO and Washington need to reinvigorate their strategic dialogue. This discussion should ensure that the two countries understand each other's outlook on the region, their respective interpretation of developments and their expectations for each other. The greatest danger to the alliance is the prospect of one government failing to respond in a crisis as anticipated by its partner. Yet the language of national security is imprecise: What constitutes "an imminent threat"? What is the meaning of "pre-emptive use of force" When would it be used? Abe needs to tell us if he will seek to acquire the ability to conduct a pre-emptive strike. Today, senior Japanese officials proclaim Japan's right to take such actions (most frequently vis-a-vis an imminent North Korean missile attack) but, in truth, Japan does not possess the military capability to unilaterally exercise this "right." » ABE MUST ensure that the road map for the implementation of the redeployment and reconfiguration of U.S. forces in Japan is carried out. All politics is local and Japanese prime ministers have been slow to intervene directly in local affairs when alliance issues are involved. Even as strong a supporter of the alliance as Koizumi was reluctant to use political capital to intervene on behalf of the alliance. That hesitation -- and the accompanying tendency to assert that Japan is merely acting in response to U.S. demands -- must end. Abe must speak forcefully on behalf of the alliance. He also must make the case that Japan is acting in its own interest, not merely as a result of U.S. pressure. » THE PRIME minister could invigorate the security alliance by thinking more expansively about its content. Abe has said he is committed to revising the constitution. Such a step would open the door to new opportunities and options for Japan, but such a process will be slow and controversial. The prime minister can quickly add new life and energy to alliance discussions by thinking more creatively about security concerns. In this regard, we note that the two alliance partners have unique reach and capabilities to deliver aid and relief in disasters, or to respond to new security threats, such as pandemic diseases. Greater intelligence sharing is another logical area for alliance deepening. Cooperation on most, if not all, of the issues outlined above can be discussed within the existing alliance framework without constitutional amendment, or even reinterpretation. Broadening the scope of alliance discussions to include them would address national security concerns and bring new people into the talks, thus broadening the base of the alliance itself. All of these suggestions depend on the first step: Abe must articulate a vision for his country that Japanese can rally behind and which will provide the foundation for diplomacy with allies, friends and potential adversaries. Failure to do so will create uncertainty and confusion and raise fears. Brad Glosserman and Ralph A. Cossa are executive director and president, respectively, of the Pacific Forum CSIS (pacforum@hawaii.rr.com), a Honolulu-based nonprofit research institute affiliated with the Center for Strategic and International Studies in Washington.